Hydroponic is a combination of Greek words of hydro (water) and ponos (work). In other words, hydroponic is a planting method using water as the growing medium. Hydroponic can be the main choice of farming when water is scarce because it is continously recycled in the system. 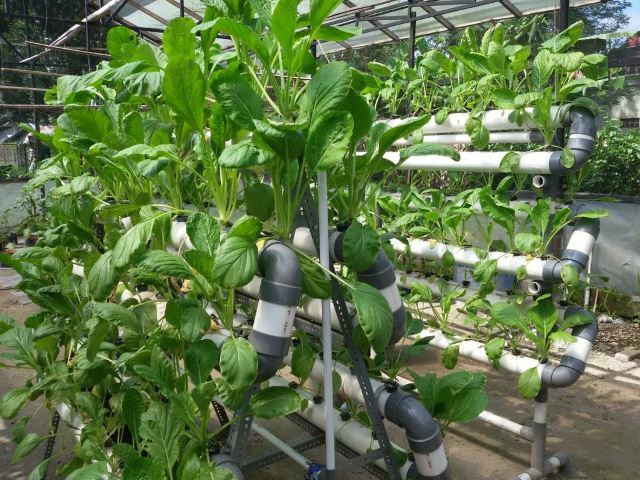 Moreover, it provides free time for busy people because hydroponic does not require as much labor as conventional agriculture once the system is in place. Also, for people who are concerned about where their food comes from, this method provides a safe alternative because the use of pesticide is very minimal. Other important factors to be considered for hydroponics are: sunlight, air, water and nutrients. Hydroponic nutrients usually come in two separate containers, labelled A and B, containing concentrated fertilizers to avoid salt sedimentation. Hydroponic can be done in a simple way in a tub of water, using the wick system. Plants can be propped up in bottle caps using aquarium filter. Nutrients are provided for the whole lifecycle of the plants.